Back in 1886 a New York journalist described St Paul as being 'unfit for human habitation in the winter'. Locals were not going to take this insult lying down and decided to turn the snowiest spot in the States into a winter wonderland. Since then the tradition of building an ice palace - nowadays a spectacular walk-through castle of ice - has become entrenched, along with the huge party that goes along with it. 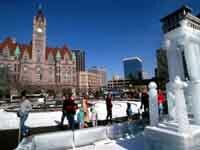 Each year the crowning of King Boreas and the Queen of Snows heralds the start of three weeks of frozen fun with events like ice sculpture contests and a torchlight parade.